Globally, stroke is the second leading cause of death above the age of 60 years, and the fifth leading cause of death in people aged 15 to 59 years old. 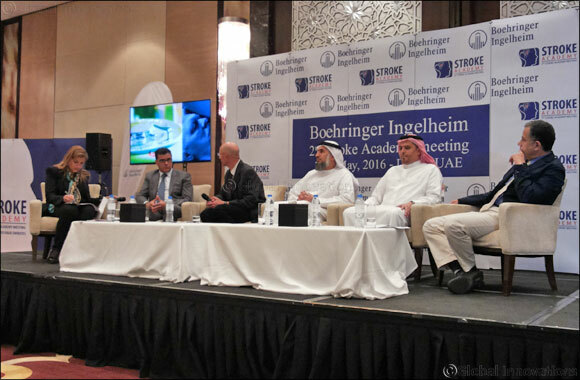 United Arab Emirates, Dubai – 1st May, 2016: At Boehringer Ingelheim’s Second Stroke Academy, leading neurologists from the region stressed on the importance of implementing immediate stroke treatment procedures so that lives can be saved and permanent disabilities are reduced. Boehringer Ingelheim’s Angels initiative aims to improve the treatment of stroke providing doctors with the necessary tools, resources and support they need to optimize and set up acute stroke networks and develop stroke centers. It looks at developing the right infrastructure catered to provide optimal patient care while facilitating acute care because there is an urgent need to develop strategies to provide a better care for stroke patients in the region. Across Middle East and North Africa (MENA), stroke is increasingly becoming a major health problem, with projections that deaths from it will nearly double by 2030 . The incidence of stroke has varied extensively among studies. Studies reported rates from 29.8 per 100 000 people in Saudi Arabia to 57 per 100 000 people in Bahrain. Specifically, in the UAE, 50% of stroke patients are below the age of 45 years, as compared to the global average where 80 percent of stroke patients are above the age of 65 years. Moreover, stroke admissions to hospital are on the rise in Africa. About half of all strokes are caused by high blood pressure and strokes are responsible for more than half of all death and disability related to cardiovascular disease in sub-Saharan Africa. It is estimated that around 360 South Africans suffer from stroke on an average per day, of which about 110 die and about 90 are left with a life changing disability, causing strokes to be the leading natural cause of disability and the fourth most common cause of death. Neurologists at the event urged correct protocols in hospitals are extremely crucial in management and treatment of stroke and can actually save a life and even have a patient walk out with minimal disability. When a stroke patient arrives at the hospital, the maximum time from door to administering of the treatment should not be more than an hour. The patient arrives at the emergency room, is sent to the triage nurse who examines the patient and, upon confirmation, provides the treatment. The patient is taken for a laboratory test, the core team begins action, performs a CT scan and finally, the injection is administered. “Our vision for the coming five years is to rollout a stroke unit across hospitals in different districts around the UAE, improve thrombolysis rate to reach an average of 18-20% (a worldwide best practice), establish tele stroke units in urban areas, as well as increase patient awareness to recognize symptoms leading to stroke,” added Dr. Al-Rukn. Karim El Alaoui, Managing Director and Head of Prescription Medicine at Boehringer Ingelheim Middle East, Turkey and Africa (META) said, “The region still lacks more insight on the prevalence of stroke. Boehringer Ingelheim’s Stroke Academy provides a robust platform for leading neurologists to shed light on important data related to the proper and effective treatment of stroke. We will continue building on our commitment towards stroke patients, and our Angels program is one of many steps that have been put in place to support healthcare professionals as well as stroke centers in the region. Our ultimate aim is to have an equipped stork center in every corner so we don’t lose lives due to the time lead needed to reach to the nearest center”. The MENA Stroke initiative ‘Making every second count’, a subdivision of the global Angels program dedicated for the MENA region and managed by a group of renewed neurologists in the region, has three major objectives - focusing on accelerating the decreasing door to needle times- which is the interval between patient’s arrival to the hospital and starting the treatment; support in establishing a dedicated stroke unit in hospitals which will directly lead to faster and better patient outcomes and raising as well as increasing the awareness of proper stroke management amongst the public and healthcare professionals. Neurologists at the event discussed immediate treatment on occurrence to save lives, reduce door-to-needle time, and encourage better patient outcomes. The longer a stroke remains untreated, the greater is the chance of stroke related brain damage. Emergency medical treatment soon after symptoms begin improves the chance of survival and effective rehabilitation. The Angeles initiative aims to implement stroke units within hospitals to reduce the burden of stroke disability by improving the level and speed of care the team is able to provide. Every year, 15 million people worldwide suffer a stroke. Nearly six million die and another five million are left permanently disabled. Stroke is the second leading cause of disability. In the UAE, one person suffers from a stroke every hour. Every year, between 7,000 and 8,000 people suffer from a stroke across the UAE. Stroke is considered the leading cause of death and, the second leading cause of disability.